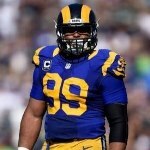 One of the most intriguing matchups of Super Bowl LIII is perhaps the battle between New England Patriots’ center David Andrews and Los Angeles Rams’ defensive tackle Aaron Donald. The Patriots this season have become one of the most physical teams at the point of attack and Andrews is one of the players to lead the way. His ability to anchor the offensive front and seal the tackle allows the Patriots running backs to get to the second level of the field and get big chunks of yardage, something they have improved on this postseason. Andrews is quick, but he’ll face a huge challenge in Donald who, from the other side of the line of scrimmage, can often get some big-time penetration against almost anyone he faces. Donald’s very quick getting through the hole and getting to the ball, something that makes him a defensive force regardless of what role he plays on the football field. As a pass rusher he’s able to get to the quarterback and get the sacks, and as a run stopper he frequently gets to the backfield and gets tackles for loss. Donald, along with his teammate Ndamukong Suh are capable of disrupting everything that the opposing offense is trying to do. Donald’s numbers this season have been impressive and that’s why he’s one of the leading candidates to earn the Defensive Player of the Year award for the second season in a row. This year he closed the regular season with 59 total tackles (41 solo), 20.5 sacks, four forced fumbles, and two fumble recoveries. Suh also earned 59 tackles this season (36 solo), 4.5 sacks, two fumble recoveries, and four passes defended. With these two tackles playing at such a high level, Andrews and the rest of the Patriots offensive line will have to be atop their game to protect Brady and open holes for the Patriots backs.